Founded in 1956, ACEC Oregon (American Council of Engineering Companies of Oregon) is a non-profit business association [501(c)(6)] whose primary goal is to protect the public welfare and advance the professional quality of consulting engineers and land surveyors in private practice. ACEC Oregon represents about 3,700 employees in Oregon and southwest Washington through approximately 120 consulting engineering and surveying firms of all sizes. There are also about 30 affiliate member firms. 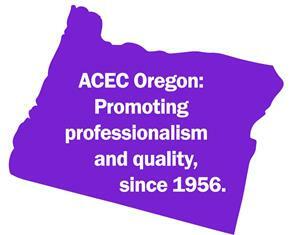 Originally named the Consulting Engineers Council of Oregon (CECO), it's name was changed to ACEC Oregon in 2002. ACEC Oregon is a member organization of the American Council of Engineering Companies (ACEC) in Washington, D.C. With more than 5,000 member firms representing more than 500,000 employees throughout the country, ACEC is the largest national organization of engineers engaged in the practice of consulting engineering. Created to assist consulting engineering and surveying firms in achieving their business-related goals, ACEC Oregon promotes professionalism and quality, and is the only organization with a staff lobbyist watching out for the business interests of consulting engineers and land surveyors in Salem.